Black Cosmic is a Natural material. Black Cosmic is a Low priced Granite stone. 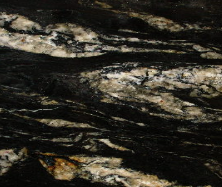 Black Cosmic is a very popular granite that is mostly black, but you’ll also be able to find variations of it with silver, gold or white streaks running through it. A natural material, with every block taken from the ground extremely different to the last. This is a granite that you will need to select personally as every slab is unique. Black Cosmic today is mostly used as a centre piece in kitchens, such as a kitchen island, and it looks fantastic on white units and come well with country style kitchens. Black Cosmic is a Natural Granite from Brazil, Landford Stone offer this type of stone in a variety of thicknesses and finishes. Black Cosmic is a Low priced stone and will look incredible in your home! We just wanted to say thank you for our beautiful worktops. They look even better than we'd hoped and set-off the kitchen wonderfully. The customer service we received from start to finish was also second to none...from the help we received when choosing the worktops to the templaters and fitters at the end of the process. We will not hesitate in recommending Landford Stone to anyone looking for quality solid stone worktops.